Somewhere along the line, often times at home but sometimes in their early years of school, students, especially girls who’re still receiving messages that they’re just not as good at math as boys, buy into the “I’m just bad at math” myth, line, hook, line, and sinker. Yes, certain people are predisposed to have a particular talent when it comes to complex mathematics. People like Einstein – or even modern mathematic geniuses – seemingly stepped right out of the womb with an innate ability to handle facts and figures in a way that most of us feel we never could. But new research is showing that our mathematic abilities, as well as the entire conception of traditional IQ, is anything but hardcoded into our genetics. There is some latent talent for individuals and that isn’t there in others but the reality of the situation is that our brains are so elastic and so capable of learning new things that anyone can become good at mathematic with enough practice and due diligence. Purdue University psychologists in a recent research project have concluded that there are two real “orientations” towards ability. On the one hand, you have students that feature an incremental orientation. These are the kinds of students that believe in learning new things, that they aren’t locked into their IQ right out of the gate, and that understand hard work is the only way to develop new skills and new abilities – particularly in a field like mathematics. On the other hand, you have students with an entity orientation, believing that their educational capabilities are not malleable and are instead a fixed quality of themselves that cannot increase. 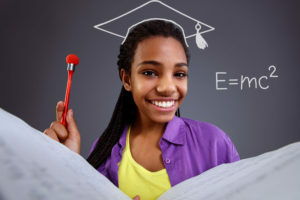 In their study, these psychologists convinced some poor, minority, junior high school students that previously had this orientation they could make themselves smarter by working harder, and it worked…they did get better grades! The research shows that it’s this belief system – this orientation – and this approach to learning that dictates the success students will have. When they understand they’ll bump into challenges when they try to learn new things but that they can be overcome, they flourish and grow.